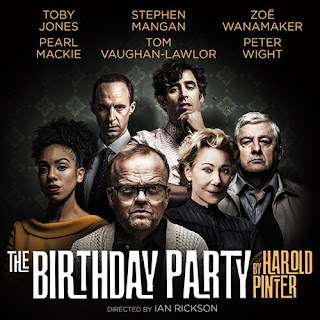 Last night Stuart and I went to help The Birthday Party - Harold Pinter’s classic play - celebrate its 60th birthday at the theatre that bears the playwright’s name in London's glitzy West End. Seasoned Pinter-helmsman Ian Rickson’s superb production has an outstanding, stellar six-strong cast: Toby Jones, Stephen Mangan, Pearl Mackie, Tom Vaughan-Lawlor, Zoe Wanamaker and Peter Wight. Pinter’s play, savaged by all but the Sunday Times’ Harold Hobson on its legendary London premiere in 1958, has nonetheless grown to become one of his most famous and most performed works. Revivals are regular, on stage and on the airwaves, but few can boast as many big names as Rickson’s. But does Pinter’s disturbing portrait of life in a beach-side British boarding house still hold water 60 years after its debut? You betcha! The Birthday Party is about Stanley Webber, an erstwhile piano player who lives in a rundown boarding house, run by Meg and Petey Boles, in an English seaside town. Two sinister strangers, Goldberg and McCann, who arrive supposedly on his birthday and who appear to have come looking for him, turn Stanley's apparently innocuous birthday party organised by Meg into a bit of a nightmare. If you haven’t seen the play before, it still works like a thriller, its outcome as uncertain as everything else about it. It's a sort of cross between Agatha Christie and Kafka with its incomprehensible reversals, nameless terrors and laughter as dark as the grave. Toby Jones plays Stanley and it's a show stealing performance. His Stanley is nervy and audacious, pampered and feral at the same time, and mesmerising to watch. Stephan Mangan's turn as Goldberg is electrifying. He is by turns matey, delusional, bombastic, and charming. He is the psycho house-guest from hell but you cannot take your eyes off him as he flashes a megawatt shark-like smile. He holds forth, fires questions, laughs, all alpha-male man-spreading swagger, tinged with the promise of extreme and joyful violence. We loved it. Pinter’s play has aged well, and I'd go so far as to say its combination of humour and horror has matured into the perfect metaphor for Brexit Britain.